Trani is a historic fishing port in Puglia, southern Italy, between Bari and Barletta on the Adriatic coast. It's on Italy's mainline railway network so is easy to reach, and it's a lovely place to explore, wander or relax. The town is reminiscent of 1950s films set in old-fashioned seaside Italy: historic buildings fading with casual charm, boats in the harbour and sleepy dogs lazing in the midday sun by the deserted waterfront. Trani makes a good day-trip if you are staying in Bari or nearby. It would also make a good alternative base for seeing the area: much more peaceful and safe than the big city of Bari. 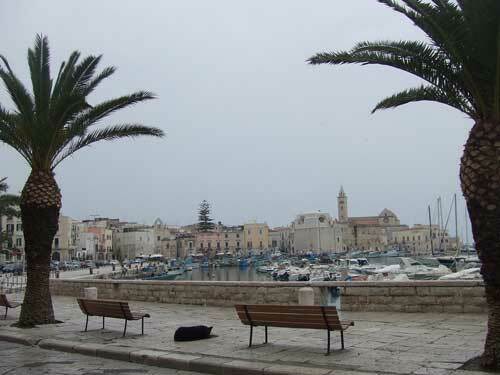 Trani doesn't have many specific tourist sights; it's the sort of place to wander along lanes and admire harbour views. The one really important thing to see is the cathedral, the Cattedrale di San Nicola Pellegrino, which dominates the seashore from a spectacular position at the water's edge. Dating to the twelfth century, the cathedral is dedicated to St. Nicholas the Pilgrim, a different St. Nicholas to the famous saint venerated in nearby Bari. The building is wonderfully imposing and is one of the most renowned sights of Puglia. The exterior is chiefly Romanesque in style, with a tall elongated facade, rose windows and a stately campanile. Its decorative bronze doors (now displayed inside) are the work of a local artist, Barisano da Trani. The interior has been stripped back to its original Romanesque appearance: simple, lofty and attractive with a few appealing details such as carved stone figures supporting columns. The building has several levels: beneath the main church is an older one dedicated to Santa Maria della Scala, with some remaining Byzantine frescoes. At a still lower level is a chamber said to date to the sixth century. The church's main crypt contains the remains of the saint. Up in the main church, don't miss the surviving sections of a 12th-century mosaic showing Alexander the Great and Adam and Eve. 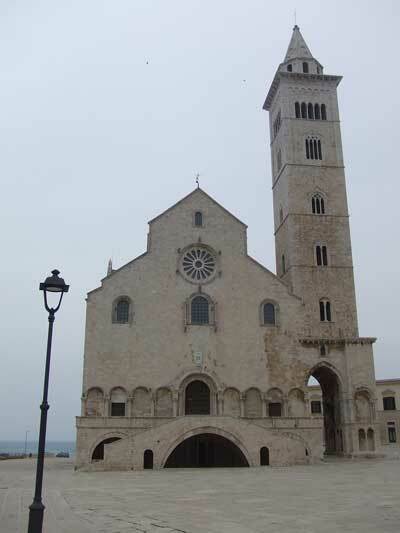 Near the cathedral is the church museum, the Museo Diocesano, which exhibits a collection of sculpture and archaeological finds from Trani's churches. Trani's defensive fortress, the Castello Svevo, is on the shore just beyond the cathedral. It dates to 1249 and is one of the many castles built in southern Italy by the Holy Roman Emperor Frederick II, one of the area's most interesting historical figures. For a long period (until the 1970s) the building was used as a prison; nowadays it's open as a tourist attraction, although there isn't that much to see. There is an admission charge, although tickets are reduced for 18-25s and free to under-18s and over-65s. The castle houses occasional exhibitions and special events. 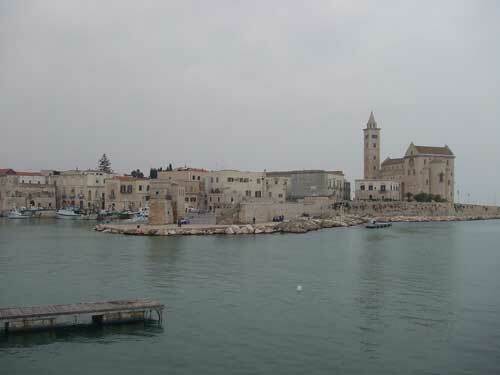 On the low headland behind the cathedral is the oldest part of Trani's historic centre. Exploring the lanes here, the visitors comes across picturesque corners and interesting sights like the roadside bas-reliefs pictured on the left. The most famed of Trani's historic dwellings is the fifteenth-century Palazzo Caccetta on Via Ognissanti, which belongs to the council. 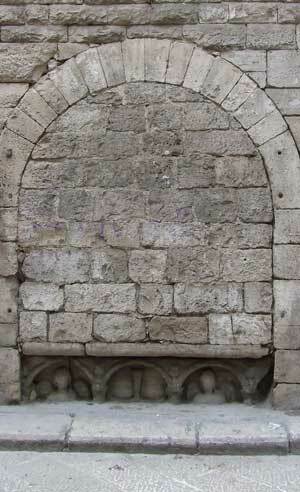 Nearby is a twelfth-century church built by the Knights Templar, the Chiesa di Ognissanti. Trani was on a route used by crusaders heading to and from the Holy Land, and there was a hospital here for the sick and wounded. You can see the exterior of the church from the harbourside (the curved apse) or from the lane the other side of the building; unfortunately it is not usually open to the public. Inland towards the railway station the streets are more modern but despite the traffic which runs along them, there is still a rather old-worldly air to the wide pavements and shops. It's a promenading kind of town, and some of the lanes and squares probably haven't changed since the nineteenth century. In one mellow piazza a sign advertises: Trani: Città Slow; in the midday lull the description couldn't have been more apt: other than a bird singing we were the only life. There is a pleasant walk around the harbour, with benches to sit on while passing the time. From the breakwater at the south-eastern side there are great views back towards the cathedral. Just beyond is one of the most pleasant spots in Trani: the nineteenth-century public gardens, the Villa Comunale. I found an old postcard of Trani and these old-fashioned gardens don't seem to have changed at all. The park is leafy and runs right along above the sea-shore offering views out to sea and along the shore to the south. There are places to sit and to sunbathe. It should combine with the harbour breakwater to make a pleasant stroll, though when we visited there was no connecting access. The main access to the park lies just above the harbourside on Piazza Plebiscito. 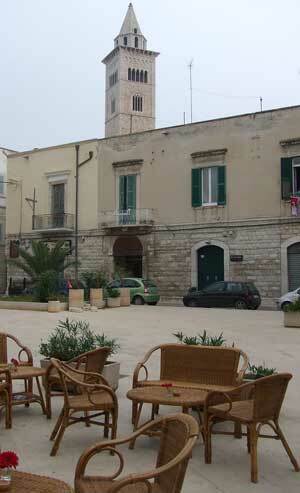 Trani has a tourist information office by the harbour on Piazza Trieste, with limited opening hours. To reach the harbour from the railway station, walk straight along Via Cavour until you've crossed the leafy Piazza della Repubblica. Ahead the street continues until the public gardens on the seafront. To reach the harbour turn left after Piazza della Repubblica, and when the street branches you should veer to the right. Since the town has a working fishing port, seafood is a speciality here and you'll find a number of restaurants, particularly near the harbour, where you can enjoy it. Fishermen sell their fresh catch along the waterfront, and sampling some of this might be a good idea if you are self-catering. You'll also find cafes where you can sit with a drink or snack along the waterfront and by the cathedral. Trani is on the main railway line heading south to Bari. It is also connected with local destinations like Andria and Barletta by bus services, run by STP. The nearest airport is Bari Palese Airport, just a few miles from Trani. Trani is just a few miles south of Barletta, a less picturesque but still appealing port, famous for an ancient bronze statue. It is also fairly close to Castel del Monte, Frederick II's famous castle on a hill which is now a UNESCO site - if you are relying on public transport, take a bus or two trains (change in Barletta) to Andria and catch the Castel del Monte bus there. Bari is a rather rough city which doesn't appeal to everyone, but the old town is attractive and is worth a day trip. Bari is also an important hub for onward travel. With its networks of attractive streets, its pretty harbour and its waterside promenades, Trani is a pleasant destination for a short break, or a good place to spend a couple of nights as part of a tour of Puglia. There are easy transport options for moving northwards to the Gargano peninsula or southwards using Bari as a hub. From Bari travellers can head into the Salento towards Lecce, visit Alberobello or cross the regional border into Basilicata to see the famous cave-dwellings of Matera.